Readukkah is back on for me! I got my copy of The Hired Girl by Laura Amy Schlitz last night. The extended Gauthier family gave up massive present exchanging a few years back in favor of one of those gift swaps. They don't take much time, so we added various Christmas Day activities to fill in the time. Last year we had a poetry slam. This year I'm conducting a literary salon. I'll be reading a section from The Hogfather by Terry Pratchett. So, yeah, I'm reading that right now. 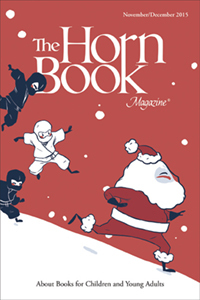 And, finally, I am actually reading the November-December The Horn Book while it is still November-December. Doesn't the cover look Christmasy? The content hasn't been too Christmas-like yet. Usually at this time of year I'm reading off the Cybils nomination lists. It helps me catch up with the books that were released recently and supports the Cybils. Since I'm going to be a second-round judge in January, I thought I'd stick to that for my Cybils reading this year, freeing me for seasonal reading. I've had The Hired Girl for a while and was planning to read it over the holidays. It is an interesting choice for Readukkah. I will be curious to hear what you think of it. And thanks for the Hogfather reminder. Terry Pratchett wrote so much, I sometimes forget things I've read or want to read (I should probably keep a list). Aren't you a MG Fiction Second Round Cybils judge? So am I.
Oh, yes. MG Fiction. I saw you on the list. Well, I was interested in "The Hired Girl" for Readukkah because I believe the main character becomes involved with a Jewish family. (I know what the involvement is, but I don't want to post what might be a spoiler.) So I'm hoping for some Jewish cultural material from the early twentieth century. There's no way I'll be done with "Hired Girl" by Monday in order to make this a Readukkah book. I do have another post in mind, though.